Over seven articles, I’ve detailed my three-year journey through my high school theater department. In this eighth and final installment, I’ll be going over my final role in my final play, The Children’s Hour. I’ve written seven previous articles about my time in my high school’s theater department, so if you want to read about my experiences with Wonderful Town, The Cherry Orchard, Julius Caesar, Ragtime, And Then There Were None, She Kills Monsters, and Pippin, then you can in the links I’ve included. 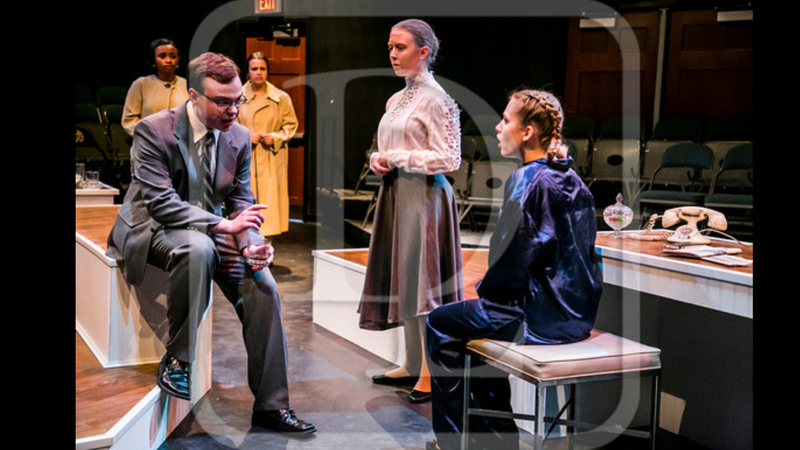 The Children’s Hour is a highly unconventional play for high school theater, as it tackles very dark subject matter. Written by Lillian Hellman in 1934 and set in the same year, it sees how everyone’s lives fall apart when a girl decides to lie about two of her teachers having a lesbian affair. Due to the lesbian element, the play was extremely controversial when it first debuted, but it’s still a very uncomfortable play to sit though today due to how messed up it gets towards the end. I learned from my mistake of not preparing enough for my audition for Pippin, so I made sure to read through the entire script to prepare for my part. And there was really only one part to go for. The Children’s Hour mainly takes part in a girls’ school, so there are only two male characters in the entire play. There’s Joseph Cardin, a lead role who is the fiance of Karen Wright, one of the teachers being accused, and a grocer boy who appears for less than a minute and has two lines. So I was either going to get a lead, get an extremely small role, or not get in at all. However, the small number of male roles meant that less guys auditioned, so it was just me and two other guys. It came down to me and one other guy for the part, and wouldn’t you know it, it was the same guy who got the part of Charlemagne over me for Pippin. The director was visibly getting frustrated as we performed, not because we weren’t doing well, but because she couldn’t decide who was the better part. We were so similar in our performances (and I was just as deliberate!) that we made a pretty tough time for her. Uh… what?! She sent a picture of the call board, and there it was: We both landed the same role for Joseph Cardin… and the grocer boy. We supposed that we would alternate on nights (although one of us would get the short end of the stick, seeing as there were only three performances), although I joked that maybe Joseph Cardin was very tall and one of us will ride on the other’s shoulders with a trench coat. I asked the assistant director about it later, and she confirmed that it was unfortunately the former. But it ended up not mattering, because the other guy’s parents said he had to get a job, and thus couldn’t be in the play. Why they didn’t tell him that before auditions beats me, but I was now the only Joseph Cardin. They got another guy to play the grocer boy who didn’t even audition, but he was perfect for the role. I was aware that I got the role mainly through luck, but I was still incredibly excited and honored to have it. Cardin definitely had a sense of humor, but he was also the most real character I ever had to perform as. He also had a lot of lines and monologues, but I used the same technique I used in And Then There Were None to get all of them memorized, and I think I had them all down before most of the others, although some had more lines than me. I’m the only dude in any of these shots, so it shouldn’t be too hard to find me. And all of the pics are credited to the same photographer. Enjoy! It was the perfect role to end on. It took a lot of what I’d previously learned and made me use subtlety instead of melodrama. I attempted to charm the audience in the first act and the beginning of the second act, show legitimate rage for the rest of act two, and make the audience cry in act three. I was able to achieve all three. So, I’ve been trying to learn how to tie a tie for the past, um, three years. Not like every day, or even every month really, but I keep on coming back to it and failing horribly. So for my final performance, I decided to try one last time... and I did it. In between acts two and three, I change my tie to signify the passage of time. Usually I ask our fantastic costuming person to tie it for me, but I thought I could do it. It turned out that it had just been a fluke. I knew it was my cue, so I rushed back to the dressing room. I was supposed to have my suit jacket, coat, and a (prop) cigarette, but I didn’t have time for that. I grabbed my glasses (because seeing is kinda important, yaknow) and tried to throw my coat on me, and tore down to the stage. I entered, and the woman who was supposed to be on her way out by the time I had entered had already left. I had to think on my feet, so I skipped to the line, “Why did she come back?”, hoping to convey to the audience that I had heard the previous argument from behind the door. The next problem was that I didn’t have a cigarette, which was integral to the plot. I was supposed to put it out on the ashtray so that my fiance would think I was turning away from her. Welp, I didn’t have a cigarette, so I did the only thing I could think of: I saw a cup of water on the table, so I awkwardly dove for it and got a drink, and modified my line to say “I was getting a drink of water” instead of “I was putting out a cigarette.” I later discovered that it was supposed to be tea. The rest of the scene felt very strange without my jacket to button and unbutton, and my coat was a mess to take off and carry, but I played it off the best I could. In later asking the actresses and audience members, I apparently entered only three seconds after the woman had left, and the audience completely bought that what I was doing was what was scripted. The irony of it is that had I just kept the same tie I had (or gone for help sooner), I wouldn’t have had any of these problems, but I did what I could, and stayed in character while doing it. After I stepped off the stage for the final time, I started crying. It wasn’t theater that had turned my life around; it was the people in theater. And now it was all over. One of my best friends came offstage a few minutes later, saw me crying, and we hugged it out for a while. At the cast party, myself and the two other leads happened to be last to leave. We talked a long time about our experiences in theater, how much we meant to each other, mushy stuff like that. It was exactly the closure I needed. Thanks for reading! It’s also been some nice closure to write down some of my favorite memories from the shows I did. Now, when I’m old and losing my memory, I can read these and remember the good times I had! I also shared a few of these articles with my theater group, so if any of you are keeping up with these posts: I love you all.